The 9 Best Caterers in North Dakota! If you’re planning a big event or social gathering, it’s sometimes best to leave the food arrangements to the professionals. 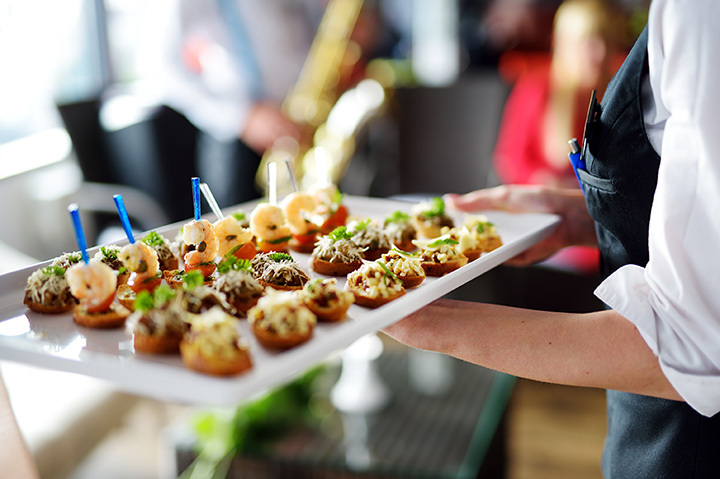 With all of the planning involved, catering your event is a great way to alleviate some stresses. Across North Dakota, you’ll find catering companies with marvelous menus of extensive varieties. Your guests won’t forget the food at your event with these great catering companies in the state! The catering side of Mezzaluna Restaurant in Fargo, Mosaic offers full-service catering both off and on-site. Mosaic’s food fits with the restaurant’s theme, which is casual fine dining. Catering platters can be hand-picked from the restaurant’s menu and individualized for the needs of your party or gathering. A part of the Garden Pavilion Restaurant and Banquet Facility, One-on-One is will give you just that, individualized service that is personalized for your needs. You can choose from one of eighteen menu options, with hors d’oeuvres, desserts, and beverages added as desired. Delivery and set-up also available. Home of the famous Drunken Pig Sandwich, Lush Lola’s provides full-service catering that is less formal than others on this list. That doesn’t mean that you will need to sacrifice flavor, however. On the contrary, Lush Lola’s has some of the best food around. They specialize in beer-braised meets, but offer a variety of different meals as well. Lady J’s can accommodate both on and off-site catering. On-site functions can host up to 350 people, while off-site gatherings can be as large as 3,000. Lady J’s can service just about any gathering, from breakfasts and lunch to high-end dinners or even picnics. The business is known for its homemade breads, desserts, entrees, and salads. Known for its deli-style cuisine, Lucky Ducks boasts the largest variety of menu options around. If they don’t have what you are looking for, they will make it for you. It is as simple as that. Lucky Ducks serves breakfast, lunch, and dinner. Family owned and operated, the Russian Olive is advertised as “smoked meats made formal or casual.” Their signature meats include smoked pulled pork, smoked brisket, smoked ribs, marinated grilled chicken, and smoky brats. A wide variety of sides and desserts are also available. North Dakota's only in-house event production company, Hometown Elegance can take care of all your event needs, from catering and flowers to music and décor. Their catering service currently includes breakfast and hors tapas, but a full-service dinner menu is in the works as well. Located at the Kings Walk Golf Course, Eagles Crest is a full-service restaurant that can also fill all your catering needs. On-site, they can accommodate as many as 160 people. Off-site catering is also available on an individualized basis. If you are looking for some of the best high-end food in town, this is the place to go. If you are looking for casual food that is high in flavor and low in cost, Scotty’s is the place to go. With a menu that includes everything from walleye chunks and baby back ribs to mini-meatballs and wild rice stuffed mushrooms, you will surely find the food combinations you are looking for.